The Global Volcanism Program has no activity reports for San Quintín Volcanic Field. The Global Volcanism Program has no Weekly Reports available for San Quintín Volcanic Field. The Global Volcanism Program has no Bulletin Reports available for San Quintín Volcanic Field. San Quintín volcanic field on the NW coast of Baja California consists of 11 late-Pleistocene to Holocene volcanic complexes. Low lava shields, initially submarine, are capped by well-preserved scoria cones. San Quintín rocks are similar to intraplate or oceanic island alkalic rocks and differ from other Baja alkalic volcanic suites. San Quintín is the only Quaternary volcanic field in Baja California where lower-crustal and upper-mantle xenoliths are found. The field is located at the margins of the Y-shaped San Quintín Bay and includes a northern and southern group of cones, Monte Mazo (connected to the mainland by a long tombolo), and Isla San Martín, 5 km offshore to the west. The youngest craters overlie deposits thought to be dated at 5-6000 years before present, and Gastil et al. (1975) considered the southern cones of Vizcaino and Sudoeste to possibly be less than 3000 years old. However, later Argon/Argon dating (Ortega-Rivera et al., 2004) restricted eruptions to a range of between about 20,000 to 180,000 years ago. Gastil R G, Phillips R P, Allison E C, 1975. Reconnaissance geology of the State of Baja California. Geol Soc Amer Mem, 140: 1-170. Luhr J F, Aranda-Gomez J J, Housh T B, 1995. San Quintin volcanic field, Baja California Norte, Mexico: geology, petrology, and geochemistry. J. Geophys. Res, 100: 10,353-10,380. Medina F, Suarez F, Espindola J M, 1989. Historic and Holocene volcanic centers in NW Mexico. Bull Volc Eruptions, 26: 91-93. Ortega-Rivera A, Bohnel H, Lee J, 2004. The San Quintin volcanic field--40Ar/39Ar geochronology and paleomagnetism. Proc Geol Soc Amer Penrose Conf, Metepec, Puebla, Mexico, Abs, p 59. Saunders A D, Rogers G, Marriner G F, Terrell D J, Verma S P, 1987. Geochemistry of Cenozoic volcanic rocks, Baja California, Mexico: implications for the petrogenesis of post-subduction magmas. J. Volcanol. Geotherm. Res., 32: 223-245. Woodford A O, 1928. The San Quintin volcanic field, lower California. Amer J Sci, 15: 337-345. The Global Volcanism Program is not aware of any Holocene eruptions from San Quintín Volcanic Field. If this volcano has had large eruptions (VEI >= 4) prior to 10,000 years ago, information might be found on the San Quintín Volcanic Field page in the LaMEVE (Large Magnitude Explosive Volcanic Eruptions) database, a part of the Volcano Global Risk Identification and Analysis Project (VOGRIPA). There is no Deformation History data available for San Quintín Volcanic Field. There is no Emissions History data available for San Quintín Volcanic Field. Isla San Martín, 6 km off the west coast of Baja California, is the westernmost volcano of the San Quintín volcanic field and the only one that is located offshore. The 2-km-wide island is a small basaltic shield volcano that is capped by scoria cones that rise to 230 m above sea level. Wave erosion has truncated part of the shield volcano, forming the sea cliffs seen at the left on the south side of the island. Photo by Jim Luhr, 1990 (Smithsonian Institution). San Quintín volcanic field on the NW coast of Baja California contains lava shields capped by youthful scoria cones. This view looks south from Volcán Basu to Picacho Vizcaino (surrounded by young lava flows), and Volcán Sudoeste (upper left). These are among the youngest features of the San Quintín field. Along with Monte Mazo to the SSE, they are constructed along a N-S line. 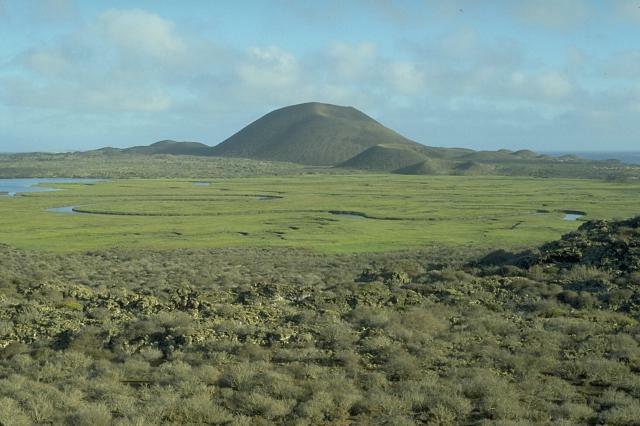 The Volcán Sudoeste cinder cone and smaller cones at its base are part of the San Quintín volcanic field in México's Baja Peninsula. They are seen here from the north on the slopes of Picacho Vizcaino. 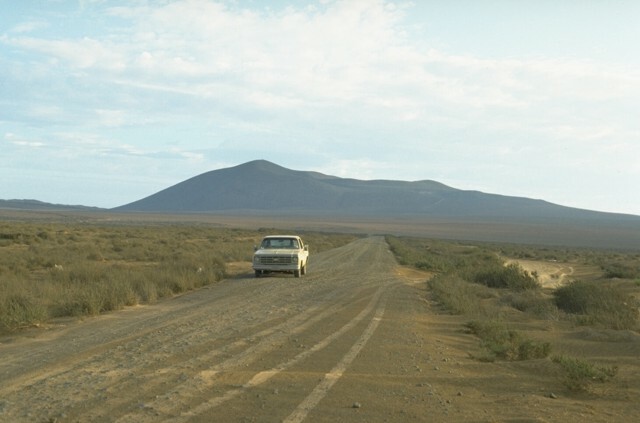 Volcán Sudoeste is one of the youngest scoria cones of the San Quintín volcanic field. It lies on a narrow peninsula between the Falsa bay (left) and the Pacific Ocean (right). 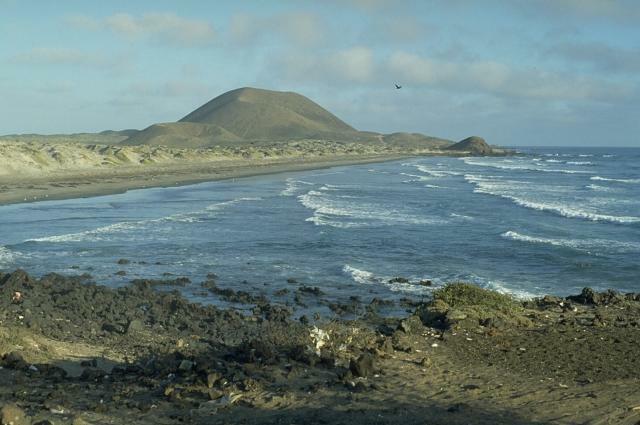 Volcán Sudoeste, one of a group of young pyroclastic cones of the San Quintín volcanic field, is located at the head of a narrow peninsula jutting into the Pacific Ocean. Volcán Sudoeste, seen here from the north, may have initially been an island. The sand bars along the coast, formed by longshore currents, connect Volcán Sudoeste to Monte Mazo, at the southern end of a 10-km-long sand spit. A vertical aerial photo shows the nested craters of Volcán Riveroll (right-center) and the intersecting craters of Volcán Basu (below and to the left). The Riveroll craters are breached to the NW (upper left). Dark-colored basaltic lava flows extend to the SE from both cinder cone complexes. The flow from Riveroll diverts around the Kenton cinder cone at the lower right. The light-colored areas are windblown sand. The Pacific coast shoreline is at the left, and the body of water at the upper right is part of San Quintín Bay. 1:25,000 aerial photo by Comisión de Estudios del Territorio Nacional (CETENAL). 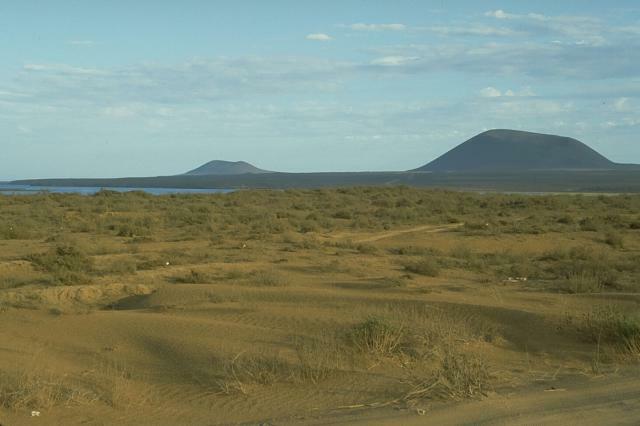 Volcán Riveroll, seen here from the NE, is the northernmost of the southern group of cones of the San Quintín volcanic field. A broad crater truncates the summit of the cinder cone and is breached widely to the NW. A smaller nested crater, itself breached to the NW, was constructed within the original crater and is the youngest feature of the volcano. 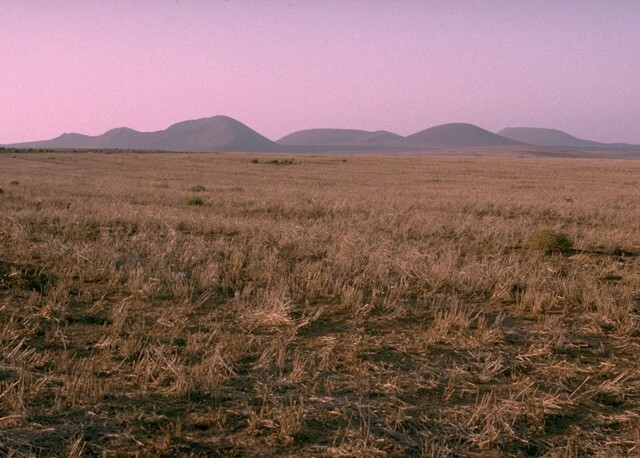 Volcán Ceniza (left) and Volcán Kenton (right), seen here from near Chapala, are two of a group of young cinder cones in the southern part of the San Quintín volcanic field in northern Baja California. Along with the Riveroll cone to the NW, they are constructed along a NW-SE line, one of several fracture patterns in the San Quintín field. 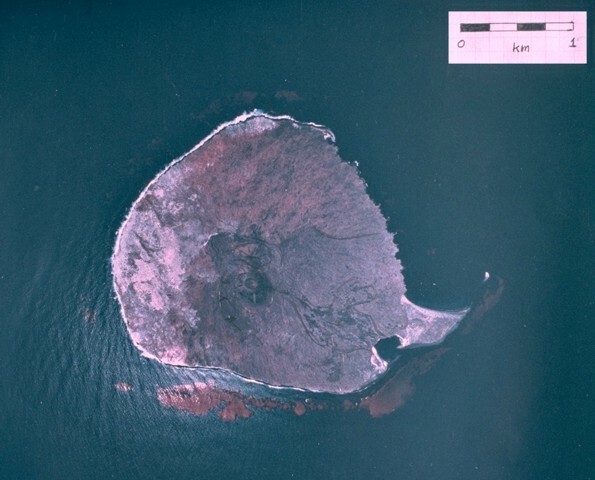 The two cones form a peninsula jutting into Bahia Falsa, part of which is visible at the left. 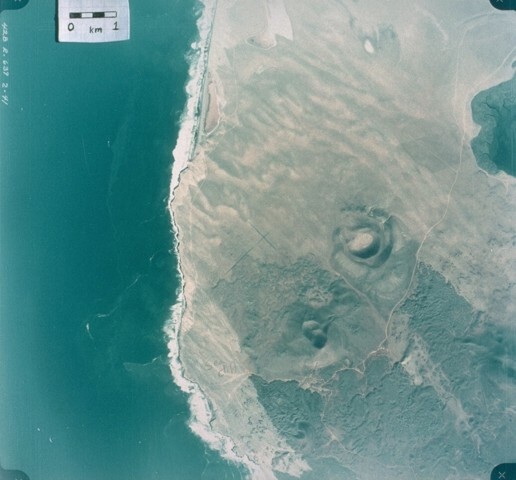 A vertical aerial photograph shows the small, roughly 1-km-wide Isla San Martín, the westernmost of the small volcanoes of the San Quintín volcanic field. 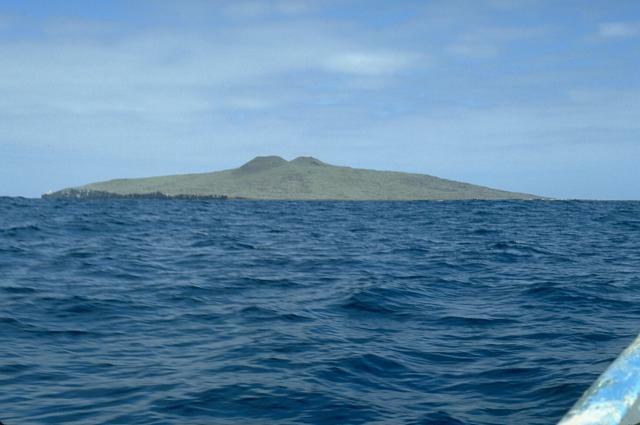 Isla San Martín lies 6 km off the Pacific Ocean coast from the rest of the volcanic field and consists of a small basaltic shield volcano capped by a less than 40-m-high cinder cone. The peninsula at the SE (lower right) side of the island is formed by a lava flow. 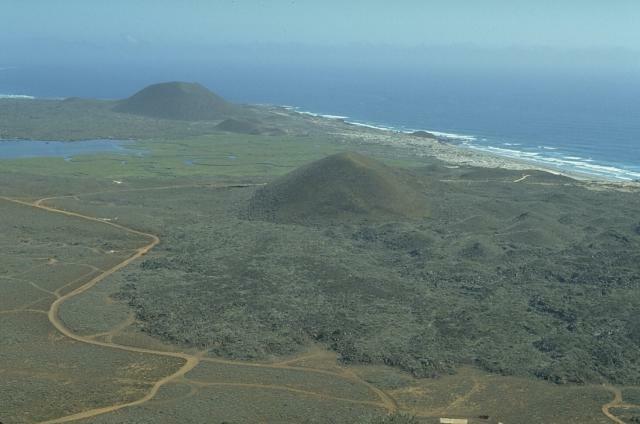 The Woodford group (Ieft) and Media Luna (right), seen here from the SSE, comprise the northern group of cones of the San Quintín volcanic field. The Woodford group consists of a closely spaced cluster of breached cinder cones and associated lava flows. The large cone of Media Luna is breached to the east and fed a lava flow in that direction. The following 100 samples associated with this volcano can be found in the Smithsonian's NMNH Department of Mineral Sciences collections, and may be availble for research (contact the Rock and Ore Collections Manager). Catalog number links will open a window with more information. Large Eruptions of San Quintín Volcanic Field Information about large Quaternary eruptions (VEI >= 4) is cataloged in the Large Magnitude Explosive Volcanic Eruptions (LaMEVE) database of the Volcano Global Risk Identification and Analysis Project (VOGRIPA).